Heaven’s Best Carpet Cleaning Wilmington NC offers carpet cleaning, rug cleaning, upholstery cleaning, and more! Our carpet cleaners give you the best value and we are confident that Heaven’s Best is the only carpet cleaning company you need. Call to talk to your local carpet cleaning technician to find out which cleaning service is best for you. They can answer your questions and schedule an appointment. At Heaven’s Best Carpet Cleaning Wilmington NC, our four-step low moisture process and our proprietary cleaning solution get out stains others leave behind. Duane offers his personal NO RISK – NO WORRY 100% SATISFACTION GUARANTEE. 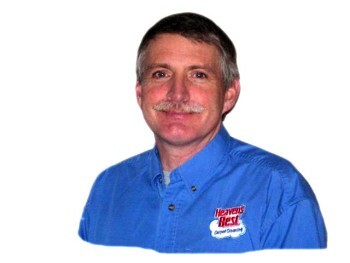 In his quiet, caring manner he will inspect your carpets, address any concerns, and explain your options. There will be No Pressure and No Surprises. He will clean the first small room or reasonably sized area for your approval. If you are not completely satisfied with the results he will leave with a cheerful “thank you” and you owe nothing. That is why he has so many repeat customers and referrals. He is not just a carpet cleaner, he pays meticulous attention to every detail, he cares about the results and he cares about his customers. We are pleased to have Duane and his wife Melissa as owner/operators serving the Wilmington, NC area as part of our carpet and upholstery cleaning team. No sticky residue to re-attract the soil. This will ensure your carpets will be clean much longer. We offer stain protection as well. Our stain protector will help protect your carpet from future spills that may happen on your carpets. There is no good reason for the problems and inconvenience of wet carpets and long dry times. Our Dry in 1 Hour guarantee ensures that you don’t have to walk around with wet carpets all day. Your carpets will be dry in 1 Hour after we leave. At Heaven’s Best we want to make your life easier. Our citrus-based cleaning solution is doctor and veterinarian recommended. Harmful chemicals of other cleaning solutions can be damaging to your skin or lungs. We guarantee the safety of our cleaning solutions. You don’t need harmful chemicals to get the heavy stains out. Our cleaning will leave your carpets smelling fresh and clean. We make it so easy for you to enjoy clean healthy carpets that will make your house look great! Allergies and other health problems are often reduced as well as a bonus to the cleanliness of the carpet. Visit our Youtube channel to see some of our work! Duane is very good at his job, cares about what his clients think, and knows what he is doing. I would recommend him to others. Our tile and grout looks brand new after Duane cleaned it. Thank you Heaven's Best. First time and very satisfied customer!! My carpets look FANTASTIC!! Carpets really do dry in a hour. Thanks Heavens Best I will definitely be a returning customer! "My carpet looks great, every happy with the service and will recommend this company to my friends." Wow!! It really is Heaven's Best. Duane has been cleaning our carpet here at Plantation Village for several years. Our residents and staff are very satisfied with his cleaning.